Using Excel to create simple dashboards. Fresh off the heels of our Boosting Your Bottom Line: Bags of Money Series, CTAC is pleased to announce 'Part One' of our new ‘This is How You Do It!’ series. You told us in the Boosting Series that you wanted to learned more about the Dashboard Reports and we listened. 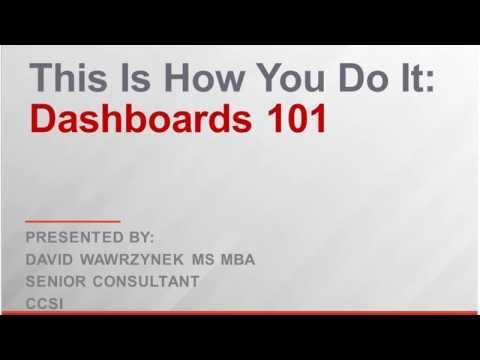 Part One in this series will offer 2 webinars devoted to making you into a Dashboard Wizard! Not only will we provide step-by-step instructions on how to use the powerful data management features in Excel, we’ll give you your very own sample database (at no additional cost) that you can use to follow along and then practice at your own pace. •Tables – Getting your data organized! •Pivot charts – The keys to success are popping out now! •Conditional formatting – Lookin’ good!